THE MONTHS HE SPENT IN MARTINIQUE during the summer and fall of 1887 (following a few weeks in Panama) reinforced the decorative bent that appeared sporadically in the pictures Gauguin had painted up to this time. He had been closely allied with the Impressionists for several years; now, geographically and stylistically he broke away from them. 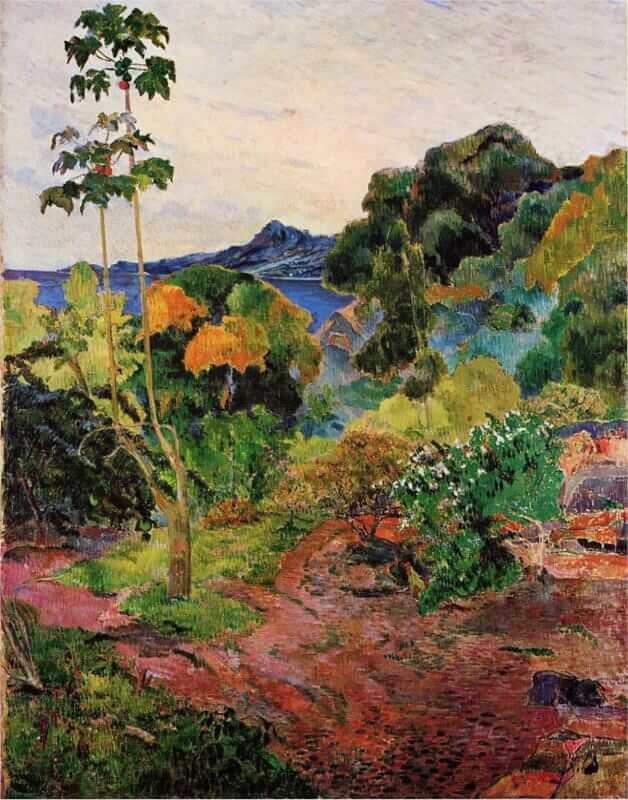 The strong light and brilliant color of the island, the over-all effect of a luxuriant vegetation that attracted the eye equally everywhere, brought out Gauguin's feeling for the decorative. It is evident in the tapestry-like handling of this landscape. The masses of the trees, with their shades of green interlarded with warm yellows, are hardly modeled at all. They are simplified into flat, overlapping planes whose edges, sometimes jagged, sometimes rounded, create a rhythm that rises from the foreground road to the hills and sky in the distance. The divided brush stroke of the Impressionist has been broadened and flattened, nor is there an effect of sunlight. There is a richness and depth of color, that instead of reflecting from the highlights seems rather to sink in and penetrate a uniform and textured surface.